Nitrogen, listed by its chemical designation, N, is the first plant nutrient listed on the labels of commercial fertilizers. The other two letters, P and K, stand for phosphorus and potassium. Nitrogen encourages the growth of roots, stalks, stems and tops of plants. 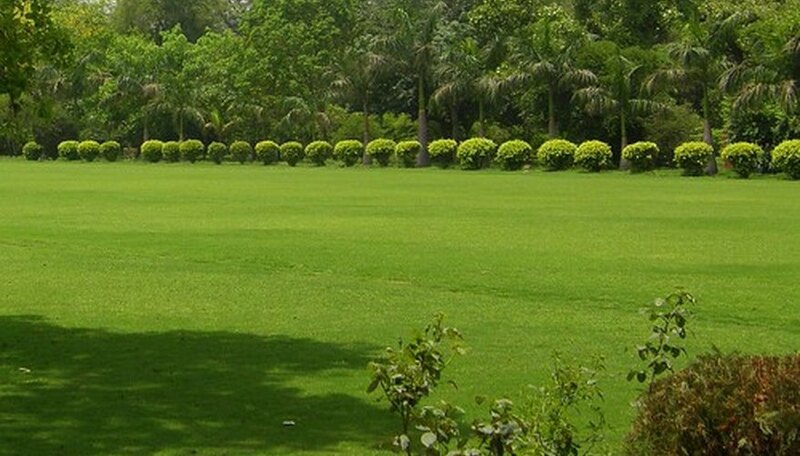 Fertilizers containing a heavy ratio of nitrogen are commonly used on lawns and crops in their growing stage. Plants' roots absorb nitrogen in the form of nitrate (NO3), the form most directly useful to a plant. Bacteria and other soil organisms turn ammonium (NH4) into nitrate. Plants transport nitrogen through the vascular system of older tissue to young tissue, which turns it into protein and enzymes. This makes nitrogen important for rapidly-growing plants. Nitrogen is in chlorophyll, the green pigment in leaves that conducts photosynthesis. A lack of nitrogen destroys chloroplasts, cells that contain chlorophyll, turning older leaves yellow. Nitrate is in chemical fertilizers labeled ammonium nitrate and potassium nitrate. Most plants can use nitrate directly; it moves quickly in water and leaches easily. Ammonium is found in chemical fertilizers labeled "ammonium nitrate" and "ammonium sulfate." Some plants use ammonium directly; others can use it if the soil is acidic. Ammonium can be absorbed both by clay and organic matter. Soil organisms turn it into nitrate. Urea, available in fresh manure and commercial fertilizers, converts rapidly into nitrate in the soil. Organic nitrogen is found in older animal manure and composts; it breaks down slowly into ammonium, a process that can take weeks to years. Ammonium ions are negatively charged; clay particles are positively charged. Opposites attract. When ammonium sticks to clay, it can't produce nitrate needed by plants. Nitrate is negatively charged. Clay repels nitrate that remains in the water and washes away. If you have heavy, clay soil you may have to amend it so that is more loose and can "breathe," enabling your plants to get more air, water and useful nitrogen. Air contains 80 percent nitrogen gas that is not directly available to plants. Bacteria in the roots of legumes--including peas, beans, clover and alfalfa--can fix nitrogen in the air, making it available to the roots of all plants in the surrounding soil. Mixing legumes with your other plants can reduce the need for nitrogen fertilizers. All animals and plants need nitrogen to build protein. If you add nitrogen-rich organic compost to soil, bacteria and other soil organisms will consume the nitrogen, releasing ammonia that can be turned into nitrates. If you add compost made of low-nitrogen organic matter such as straw or sawdust, the soil organisms use the nitrogen to build their own protein, leaving less of it available to plants. Add 3 to 4 pounds of nitrogen for each cubic yard of low-nitrogen compost. Too much nitrogen can increase concentrations of salts in the soil, causing plant “burn” and damaging leaves. Fertilizers that are high in nitrogen can spur growth of stems and leaves at the expense of flowers and fruits. Nitrogen not used by plants can leach into the ground water as nitrate pollutants.